Merino comes from merino sheep, like the little guy pictured above. The fibre is graded according to how fine its diameter is, using a measurement called micron (or micrometer). The finest fibres have the lowest micron value. Once the fibre has been spun into yarn, the micron value determines whether the yarn should be classed as fine, extra fine or super fine. Super fine merino contains the finest fibres and will usually feel the softest next to your skin. This can sometimes cause a bit of confusion, as ‘extra fine’ merino could be 4 ply, DK, aran or chunky - the name is no indication of the yarn weight! Merino is an incredibly soft fibre, which does mean that it is not the most hard-wearing. For items that are going to see a lot of use, such as socks or bags, this fibre will start to show the wear, so it may be best to go for a merino blend, or perhaps a different fibre altogether. On the other hand, merino has a light and bouncy quality to it, and can be great for people who find other types of wool too rough. Most of our merino yarns have also been treated so that they are machine washable, so they are also an easy-care wool option. This means they are great for baby items, or items worn next to the skin, like luxurious scarves and cuddly snoods. In January, I posted about a 1 ply lace project I was working on, and now I can finally reveal what it was: my first published design is appearing in print this month! 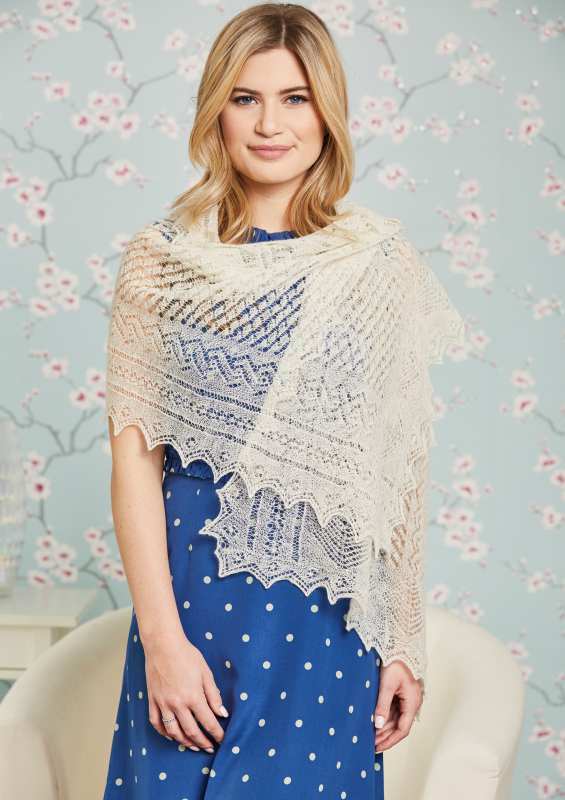 My Squill Stole is featured in Issue 88 of Knit Now Magazine, so I thought I’d share the story behind this design. I’m getting married this summer, and I knew I wanted to wear something I’d knitted myself (and I thought, “well, if I’m going to knit it, I may as well design it myself… and if I’m going to design it, I could look into getting it published…”) and that really gave me the motivation to get cracking on the project. My dad is from Shetland, and our family has always had a lot of strong ties to the islands. We would spend summer holidays adventuring with our cousins, visiting our grandparents, aunties, uncles and listening to my dad’s stories of growing up helping on neighbouring crofts and experiencing snow in every month of the year (not all in the same year, mind you). My grandma was also an amazing Shetland knitter, so I knew I wanted a design with a Shetland connection. The motifs I picked, therefore, are fairly traditional patterns found in Shetland lace designs. I chose, however, to work them in stocking stitch rather than the more conventional garter stitch. Squill is knitted in 1 ply cobweb weight yarn, so Jamieson & Smith Shetland 1 Ply Cobweb weight was a natural choice. Despite being pure wool, the knitted fabric is ultra lightweight, so hopefully it will not be too hot for a July wedding! The name Squill comes from a wildflower of the same name, which is native to Shetland. Knit Now magazine is available in the UK from Sainsbury, Tesco, Asda and Morrison's. Issue 88 is on sale from 17 May 2018. And it was thus that I discovered Wendy Traditional Aran. Wendy Traditional Aran’s 100% wool content makes it extra cosy (and fire resistant!) and gives it a rustic feel, so it was perfect for creating Celtic-inspired warmers for Beltane. The traditionally spun fibres gave excellent stitch definition, making it the perfect yarn for cabling: I can certainly see why it’s popular with our customers who make traditional cabled jumpers. I opted for the natural, undyed shade to match the rest of Hannah’s Beltane costume, but the wool also comes in a fantastic range of classic, tweedy colours to suit almost any project. I used 4.5mm Symfonie DPNs for both of these projects: the laminated coating on the needles helped me to knit much faster than normal. Have you knitted with this wonderful wool before? Here in the Edinburgh shop we love to see the different ways in which yarn bought from us is used, so please do get in touch with pictures of your finished or work-in-progress Wendy Traditional Aran projects! *Which is lucky because I accidentally made two left-handed wrist-warmers rather than a pair and ended up having to make the right-handed one in just one evening - oops!